Sharon (Rappoport) Bell: I’ve taken a job with Just Kid Inc a marketing strategy, innovation and consumer research consultancy in Norwalk. Been working with them as a consultant for the past 7 months and I just accepted a perm job. Rob Cain: Together with my Stanford MBA business partner I’ve been writing a financial blog focused on picking U.S.-listed Chinese small cap stocks, mainly OTC stocks that we anticipate will uplist to NASDAQ or AMEX. Our portfolios were up 150 percent in 2009, and up another 21 percent in the first quarter of 2010. So far we’ve treated it as a hobby, but with web traffic and readership booming we’re beginning to consider turning it into a business. You can find us at http://chinaotcplayer.blogspot.com. I’m also still producing, with a couple of feature films in the works, a TV reality series with the creators of HBO’s “Hard Knocks” that will focus on aspiring minor league baseball players, and a major live event in Las Vegas called “America’s Wedding” that will celebrate love and marriage with major music performers, celebrities, and thousands of couples from around the world. 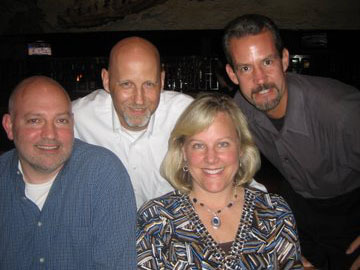 Theresa (Gende) Clouser: I recently had dinner with Brent Baum, Gary Skraba and Chris Malone in Los Angeles. We had a great time catching up on each others recent exploits. Chris Malone: After commuting from Philly to DC every week for the past two years, a few months ago I decided to forego the corporate world and started a new venture. It’s a research-based sales, marketing and HR consultancy focused on helping firms measure, manage and strengthen the key business relationships that drive their performance. You could assist me greatly by briefly testing the new relationship assessment tool I’ve developed. You can check it out here:http://www.relationalcapitalgroup.com/knowledge-center/enterprise-rq-beta/. Thanks in advance!